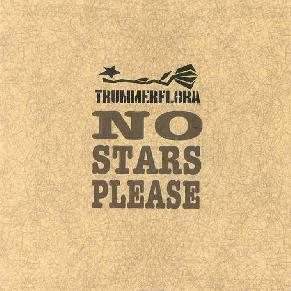 Trummerflora - "No Stars Please"
In AI #16 we were introduced to the musicians of the Accretions label when we reviewed CD's by Hans Fjellestad and his collaboration with guitarist Damon Holzborn, called Donkey. I was intrigued by the layering and blending of electronic space music, noise, jazz, and avant-rock. Trummerflora is a collective of musicians dedicated to experimental and improvisational music. In addition to piano/keyboards/electronics musician Fjellestad and guitarist Holzborn, the collective includes Marcos Fernandes on percussion (also head of Accretions), Nathan Hubbard on percussion, Robert Montoya on percussion and sampler, Marcelo Radulovish on bass, guitar, and electronics, and Jason Robinson on woodwinds. Guests include Frank Zappa alumnus Mike Keneally on guitar and George Lewis on Trombone. And reading the Trummerflora web site I see that each of the musicians is involved in numerous projects, with one another as well as artists outside the collective, as part of the Trummerflora mission is to cultivate a scene for this type of music in the San Diego, California area. No Stars Please is a collection of live recordings, with tracks ranging from 3 to nearly 30 minutes in length. Disc 1 includes the heavier, full band music. "From The Waste Up" brought to mind the Frith/Laswell/Maher power trio Massacre with horns. Or maybe W.O.O. Revelator with a thudding bass line and organ. I really loved Hans Fjellestand's organ from the his solo and Donkey CD's and it sounds great within this fuller band context. But this is 23 minutes of avant rock and jazz, and experimental sound explorations that don't let the listener snooze for a moment. Even the quieter subtle passages are busy and full of life and intensity. Dark droning guitars compete with birdsong flutes and chaotic percussion to create a primordial soup of pure sonic beauty. I even hear a gorgeous horn sound that reminds me of George Cartwright in Curlew or the more contemporary Smokin' Granny from North Carolina. Parts even bring to mind a noise-jazz version of Univers Zero. Do you get the idea that there's a lot happening here making it hard to describe? "Nonet" (parts 1-3) was recorded live on San Diego radio. Straddling the razor's edge between abstract and accessible (though leaning heavily toward the later), the music blends avant garde rock and free-jazz, forging confidently through a thicket of varied sounds. "Where's The Entrance" is an electro-acoustic excursion with a decidedly cosmic infusion. Dark, theatrical, highly dramatic, and intense. And Christmas will never be the same after listening intently to "Frosty The Snowman/Silent Night", a 27 minute glom of beautiful chaos. Mostly a noise-jazz and sound exploration, there are brief moments of the recognizable "Frosty The Snowman" and "Silent Night", though in forms you've unlikely ever heard before. For the most part the Trummerflora's get down and dirty in-the-trenches tripped out funky on this tune... rocking hard and including some mucho freaky electronics and samples. Disc 2 is a bit different, with all 3 tracks on being taken from the same performance and following a similar theme. There's lots of heavily atmospheric music and percussion, and throughout the disc we hear more of a showcase for the percussion members of the collective than any of the tracks on disc 1. I enjoyed the contrast and cooperation between the somewhat minimalist space ambience that develops, and the percussion which is sometimes busily clanging and banging, but also gives an orchestral quality to the music. Music and sound share the spotlight, dueling and interacting, and along the way creating an interesting and enjoyably hectic ride. "Punch Press Pull" is my favorite from disc 2, the electronics being more overtly spacey, though the percussion is still in the forefront. Harsh tones, drones, and noise give an edge to the spacey atmosphere, with the percussion once again providing an orchestral intensity to the proceedings. This get delightfully wacky as this lengthy track develops, and at one point I felt like I was at a surrealistic carnival in a altered conscious. "The Break Invasion" a 27 minute epic excursion that is still a busy percussion piece, but communicates a crowded urban feel, like an avant garde representation of the everyday happenings in the city. There's LOTS going on that only the most attentive listening with reveal. The percussion develops steadily as set electronic patterns provide the canvas on which the drummers lay down their brush strokes. An excellent set of improvised music. For more information on these and other related artists you can visit the Trummerflora web site at: http://www.trummerflora.com/. Hear this CD in its entirety at the Zu Casa web site at: http://www.zucasa.com/. No Stars Please is distributed by Accretions. You can visit their web site at: http://www.accretions.com.